We are a 100% Australian owned and proud replacement print cartridge company. Our base is in Frankston, Victoria. Basically, we are in the printing industry since 1950. Thriftyink.com.au is the result of all our extensive experience and knowledge so far. We are your supplier of premium grade ink and toner cartridges and accessories. Our main characteristic is dedication to providing constantly low prices and fast delivery. One of our main goals is unbeatable customer service. Let us add that we are the team you can rely on every time you want excellent printing results. Check out our site for more details about this new, great place that is all about good printing. We have cheap ink cartridges, compatible ink cartridges and compatible toner cartridges all at fantastic prices that you will find hard to resist! What can you find on Thriftyink.com? On Thriftyink.com you can find huge number of Genuine Manufacturer’s OEM ink and toner cartridges. Of course, we have compatible and remanufactured ink and toner cartridges also. That means we offer large variety of products for every type of job you can imagine and every budget. How to decide? If you want to rely on a brand name, choose genuine cartridges. If you don’t want to spend so much money, but you still want the quality, take a look at compatible products – it is proved that they can achieve the same level of quality. Remanufactured cartridges are refilled with ink/toner. Whatever you choose, remember that we stock only the best things and we pride ourselves on this. There are Canon, HP, Dell, Kodak, Panasonic, Samsung, Phillips, IBM. Find more than 20 categories on our site and choose among the numerous articles; we are sure there is the right one for you in every moment and every occasion. Brother, Cannon, Citizen and Dell – those are brands we are proud of. Brother is established in 1954 in Japan. It provides home, home- office, business and industrial products and offers printers, multi-function coplers, all-in-ones and mobile solutions. This brand won Readers' Choice Award and Business Choice Award for printers seven years in a row. We have genuine Brother ink cartridges and Brother toner cartridges, as well as compatible products. Canon is well-known and successful brand. It is in printing industry since 1985 and today they are still the masters of their job. If you want to entrust your printing to this brand, we can offer you either genuine or compatible Canon ink products. Citizen – “the qualities of Citizen printers can be summed up in three words: performance, precision, perfection.” That is why we are happy to offer products compatible to this brand. Dell – one of the leaders in printing industry today with huge number of sold products. There is no chance to go wrong if you decide to buy Dell genuine toner we have in stock. HP – Hewlett Packard is one of the leading players in the printing industry and the HP toner range is one of the best available on market today. HP make printers, laptops and accessories. Epson – is probably the best well known of all of the printer manufacturers in the world today. Epson ink and toners are of the highest quality and we have an excellent choice of cartridges to purchase on this site. Business ethic is definitely our priority. We value our customers and support growing of their businesses by our high quality products. We understand your need to have only high quality ink and toner cartridges. That is why we offer large variety of genuine and compatible products – they will satisfy all your printing needs and provide professional looking documents every time. Your printed materials should be more than representative, no matter what your business is, no matter how large or small it is. You can’t allow yourself to have low quality printer cartridges, don’ you? That is why we sell only supplies we can stand behind. Your satisfaction is our biggest success, as we look forward to keep every one of our customers. Call free our customer service and they will do the best to help you during your shopping. Don’t hesitate to ask – they will answer to every question you have. After your purchase, if you are, for any reason, unsatisfied with your shopping experience, the customer service will replace the purchased item and solve any other problem as quickly as possible. We are trying to improve our company, to be better day by day. Because of that, we will appreciate all of your remarks, suggestions and wishes. Our contact form is widely open for your opinion. Be sure all the comments will be carefully reviewed, so we can build a better printing world together. How to shop on Thriftyink.com.au? Shopping on Thriftyink.com is fast and easy and there is almost no chance for you to be unsatisfied after visiting this site. Use our filters for effective searching and add items to the cart. If you have problem with finding the appropriate cartridge for your need, just email us with the model number of the printer and we will find it for you in a second. At the end, click checkout and enter your shipping and payment details for finishing your shopping. We accept Visa, Master Card and PayPal as paying methods. As we want to make a pleasant experience out of buying, we guarantee the delivery will be next business day. 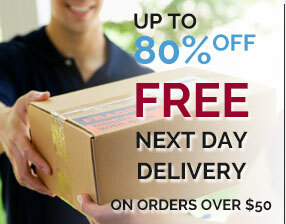 Also, there is an opportunity to save your money - every time you order over $50, the delivery will be free of charge. We know that your printing supplies should be delivered as quickly as possible, so we ship with “authority to leave” across Australia. If there is nobody at home to take the package, it will be left on your door step. Of course, privacy of your financial transactions will be absolutely respected and all of your personal data will be protected. Let us show how much we care about your pleasure. 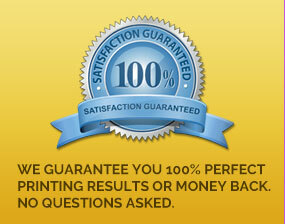 If your printing results are not great, just send us email within 60 days of invoice. The email should contain invoice number, the quantity and SKU of items to be returned. We will return your money and ask no additional questions. Perfect, isn’t it? We stock wide variety of print cartridges and accessories for all your printing needs, all at unbeatable prices that you will love! We strive to make sure that all of the products on this site meet industry standards and that our suppliers meet our stringent standards to. We want to have long standing relationships with all of our customers and providing excellent customer service is what we aim to do every day. Our customer service doesn’t just stop after you have made a purchase, we aim to please for after sales service too. You can give us call during normal business hours or send us an email, we are always happy to respond to our customers. Our customer service representatives are knowledgeable about all of our products and they can help your purchase. We have a satisfaction guarantee with all of our products, if you are not happy with your purchase, then we are not happy either. Give us a call or send us an email and we will replace any defective or damaged products quickly as possible. Our priority is that all of our customers are happy and satisfied, this is what Thriftyink.com.au is all about, excellent customer service and unbeatable good value for money products. We provide super-fast delivery next business day delivery for orders over $50 and the orders must be placed before 3:00PM AEDT to qualify. Orders under $50 are charged at $10 and these are also next business day super-fast delivery. These are two excellent delivery packages that we know that you will make you happy. Your business needs to have clear and professional documents to be printed at a cost that is acceptable, whether you are a small, medium or large company. The best way is to use high quality inkjet cartridges and toner cartridges and this is what we supply to you. Since 1950 our directors have supplied Australia we the best printing supplies at exceptional value for money prices. All of our ink and toner cartridges have been manufactured to the highest levels possible, this also includes remanufactured and compatible cartridges. You will always receive quality products from Thriftyink.com.au that you can be sure of. We are on Facebook, Twitter, Google plus, Pinterest and you can Skype us too, at the end, feel free to follow us on all social networks. Don’t miss any of the new arrivals or special deals that we offer from time to time. You should also sign up for newsletter to get all the big offers. We promise you a lot of great deals in future! And wait no more. If you want outstanding products and service, try out Thriftyink.com.au, we will build a nice long term relationship and you will shop here again for sure!